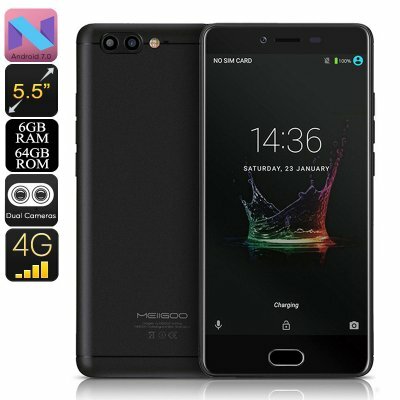 Successfully Added Meiigoo M1 Android Phone - Octa-Core CPU, 6GB RAM, 16MP Dual-Rear Camera, Android 7.0, 5.5 Inch FHD, 4000mAh, 4G (Black) to your Shopping Cart. Running on Android 7.0, the Meiigoo M1 Android phone lets you enjoy all the latest software features currently available. With access to the Play Store, you’ll be able to easily download millions of free Applications, games, and films. All these media can be enjoyed on the phone’s stunning 5.5-Inch display. By supporting 1080p Full-HD resolutions, you’ll always be treated to a stunning visual experience. With this Android smartphone in your pocket, you’ll never have to worry about feeling bored again. It has 64GB internal storage and a 128GB SD card slot. Together, these will treat you to enough memory to store all your files and media. Besides featuring the latest software, the Meiigoo M1 Android Phone also packs some remarkable hardware. Underneath its screen, this Android smartphone packs the MTK6757 CPU. This Octa-Core processor has been clocked at 1.6GHz. It comes along with a whopping 6GB of RAM to treat you to a truly outstanding user experience. This powerful Android phone is capable of handling anything you throw at it. Whether it’s games, movies or Apps – the Meiigoo M1 is sure to meet your demands. Dual-IMEI numbers and 4G let you stay connected to the web anywhere you go. This allows you to browse the internet, stream media, and share files or pictures of your latest holidays. The latter can be snapped with the phone’s stunning 16MP Dual-Rear camera. This professional-grade piece of equipment lets you shoot breathtaking images and video anywhere you go. Your cell phone furthermore comes with a 13MP front snapper that lets you engage in online video calls and snap great selfies with friends and family. The Meiigoo M1 Android Phone comes with a 12 months warranty, brought to you by the leader in electronic devices as well as wholesale smartphones..